Lisa Thomas-Laury in her home in Haverford. When now-retired, still-beloved Action News anchor Lisa Thomas-Laury was in the thick of her debilitating illness in 2004, she could hardly walk and could barely talk. What's a news anchor without her voice? All of her beautiful, shoulder-length hair fell out. Her energy level was below rock bottom. She became addicted to the opioids she was prescribed to manage the pain her illness caused. But all that's all in the past. Thomas-Laury, 63, is good now. So good, in fact, that she's embarking this month on a multicity book tour to promote her memoir, On Camera and Off: When the News Is Good and When It's Not. The book is available through Amazon and at select Barnes & Noble stores. The bulk of the hardcover tome, published by Philadelphia's Camino Books, is a detailed account of Thomas-Laury's health crisis. She takes readers on a sentimental yet frustrating journey through her picture-perfect life's interruption by a mysterious ailment, the circuitous search for a diagnosis, and a hard-fought recovery. The moral: There is power in prayer and persistence. 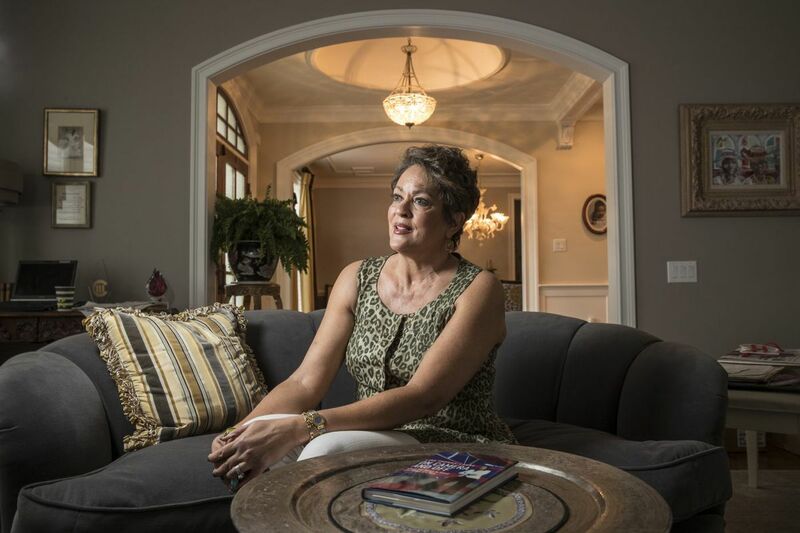 "I want this book to help others navigate through difficult illnesses that may have been misdiagnosed or undiagnosed," Thomas-Laury said at her home in a Haverford subdivision. Photos of Thomas-Laury's husband, physician Bill Laury, and her now-grown sons — you know, the ones she was pregnant with on-air all those years ago — Langston, 35, and Leland, 32, line the walls leading up the stairwell. Some of those photos are included in her 158-page book. "I wonder about that woman in Kensington, West Philly, or North Philly who doesn't have the resources I have," Thomas-Laury said. "They aren't married to doctors. How will they know how to advocate for themselves? How will they know to ask the right questions? I want them to know they aren't alone." Thomas-Laury's voice is back, a recognizable tone that's a combination of warmth, strength, and politeness. The same beautifully eloquent and authoritative pitch that made her one of Philadelphia's — and the country's — most trailblazing black female journalists carries over to the pages of On Camera and Off. Still, she gets down to the nitty-gritty of her life. During the first chapters, we return with her to her childhood in the African American college town of Institute, W.Va., where she was known as Lisa Howard. She was the oldest of four; her mother, Blossom, was a social worker. Her father, Thomas Howard, served in the Air Force and worked at the chemical plant in town. He was on his way to becoming the first black law librarian at the state's law library, but his alcoholism got in the way. At times, he was prone to violent outbursts. Reliving that, Thomas-Laury said, was one of the hardest parts of writing the book. "It was therapeutic," Thomas-Laury said. "Some of it I had repressed and buried." She attended Marshall University in the early 1970s, and while there landed a job as a weather girl at the Huntington, Va., NBC affiliate, cementing her love of broadcasting. After college, she worked on-air in Oklahoma City for eight months. While interviewing for her second reporting gig at the ABC station in Nashville, she met Oprah Winfrey, who was reporting and anchoring the weekend news there. The two connected, and Winfrey invited Lisa Howard to spend the night at her apartment. In 1978, she beat Winfrey out for the noon anchor job in Philadelphia. "I was well aware that a big part of my appeal to management at 6ABC," she wrote, "was that I was African American but didn't look 'too black.' "
Still, they became good friends. During her years on-air in Philadelphia, Thomas-Laury was considered the "Oprah reporter," meaning she got exclusives to the goings-on at Harpo Productions. Winfrey taped a video tribute for Thomas-Laury's retirement party; Winfrey's bestie, Gayle King, helped Thomas-Laury pick out the Harlem Toile wallpaper in her downstairs bathroom. "I was able to communicate with Oprah that I understood in a way that was genuine," Thomas-Laury said. In 1983, Action News 5 o'clock anchor Jim O'Brien was killed in a skydiving accident, and Thomas-Laury (who had changed her name to Thomas because there was already a Howard anchoring at 6ABC) was promoted to the coveted spot. Longtime Philadelphians still remember seeing her cry on camera when O'Brien died. She anchored the evening news for 19 years with Marc Howard. "We were the longest-running coanchor team in the country," said Howard, 80, retired now and living in Villanova. "She had everything a modern anchorwoman at the time needed to be successful: She was a good reporter, a good writer, and had a great personality, and she looked terrific. We helped each other out," Howard said, remembering a time when Thomas-Laury cautioned him not to refer to young black men — even if they were 4 years old — as boys. "I was unaware of the negative connotation until she told me," Howard said. "So I just used the word youngster instead. Thomas-Laury's life was pretty idyllic until 2001, when she started to feel the first symptoms of her illness: pain in her legs and feet while power-walking. Doctors determined that she had lost 30 percent of the strength in her ankles, and she went to see Lankenau Medical Center neurologist Edgar Kenton. He suspected a rare blood disorder, POEMS syndrome. But Kenton was planning to go to Atlanta to do medical research, so he referred her to a hematologist at Lankenau and a neurologist at Johns Hopkins University. Both doctors refuted Kenton's original diagnosis, instead erroneously concluding that Thomas-Laury was suffering from the autoimmune disease CIDP. What followed, Thomas-Laury said, were more than two years of ineffective treatments from doctors with poor bedside manner. By late 2003, she was in a wheelchair. Her internal organs were starting to shut down. Her vocal cords were paralyzed, as were some of the nerves in her digestive tract. Why did she decide to include this personal detail in her book? "So many young people I know have died from overdoses," Thomas-Laury said. "It's reaching epidemic proportions." Thomas-Laury finally returned to work part-time in 2007. When she came back from her ordeal, she said, she was overcome by the number of viewers who told her they had been praying for her recovery. "I began to see my purpose in life differently," she said, "and I had a strong feeling that I never had before about the power of prayer." In 2015, Thomas-Laury had to have a second bone-marrow transplant. She officially retired in 2016. Thomas-Laury started to keep a journal while she was recuperating from the first transplant in 2004. Initially, she said, the plan was to share it with only her family. But shortly after her second bone-marrow transplant, she found herself talking to Philadelphia advertising and public relations executive Brian Tierney about landing speaking engagements, and he encouraged her to write a book. "She's such an incredible woman with a wonderful brand," Tierney said. "She's done so much as a journalist. Her story about her health is inspiring. She's so beloved in the Delaware Valley. It had the potential to be so inspirational." Thomas-Laury was still hesitant. Then her sons began bugging her about writing the book. "Ever since I was a little boy, my mom has been a great storyteller," Leland Laury said. "It wasn't time for her to stop telling stories. She has so much more to share with the world." So she reached out to Tierney, and he connected her with Edward Jutkowitz, publisher of Camino Books in Center City. Jutkowitz was hot for the book and pushed to have it published by this year's holiday season. Thomas-Laury hopes On Camera and Off will be a launching pad to help her start an organization that helps sick people navigate the health-care system. "Putting it on paper helped me come to terms with my illness a little better," Thomas-Laury said. "I don't ask, 'Why me?' I know it's, 'Why not me?' "